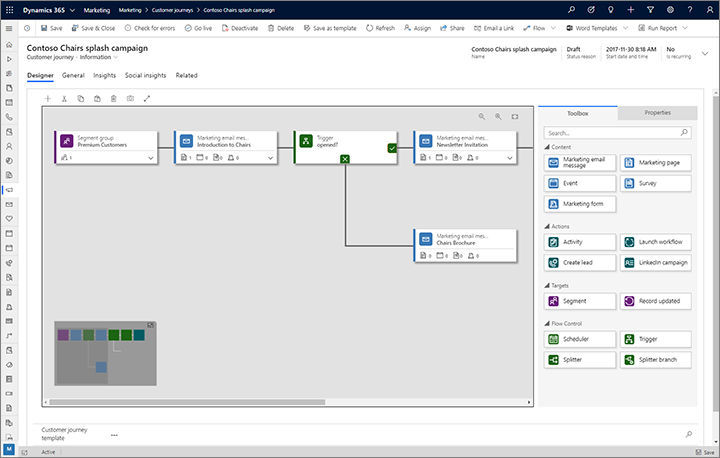 Use Dynamics 365 to visualize and automate the journey that customers will take while interacting with your marketing initiatives on their way to making a purchase. A simple customer journey might include just a short interaction, such as a single email campaign. A complex journey could include the full process from discovery, through nurturing, and on to marketing-qualified leads. 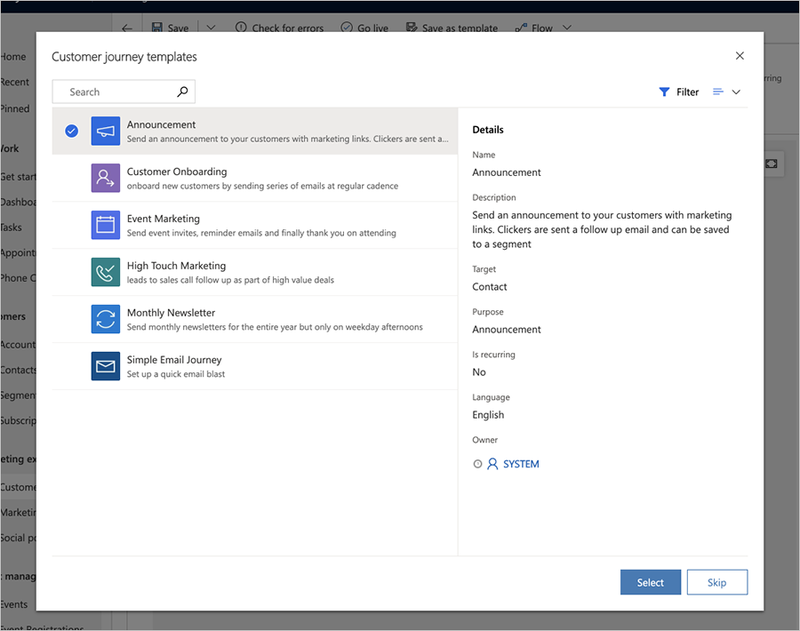 Customer journeys can also generate and assign Dynamics 365 tasks (such as a scheduled follow-up phone call), and trigger business workflows. Dynamics 365 provides a graphical, drag-and-drop, journey modeler that works something like a simple board game. Each contact starts on the first square (by becoming part of a target segment), and then progresses through one square at a time, with each square representing a marketing initiative, decision point, or internal action item. A new contact from New York wants to subscribe to your newsletter, and fills out a marketing page. This results in a new contact record in your database. You have a dynamic segment that finds all newsletter subscribers from New York, so the new contact automatically joins that list. 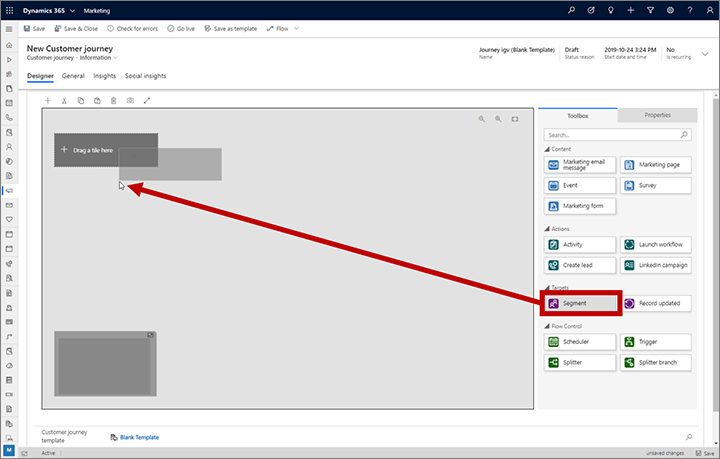 You've created a customer journey in Dynamics 365 that starts with the New York subscribers' segment as tile one, so the contact starts there and moves directly to the next tile. The next tile in the journey is an email tile, so the system automatically sends a marketing email to the new contact, and the contact moves on to the next tile. The email message offers a free white paper for download. The next tile is a trigger (set to trigger on the email). It keeps the contact here until either a week goes by, or they click the download link. The trigger branches the path, so if the contact clicks to download the paper, they'll take the "true" path immediately; but if a week goes by without a click, they'll go down the "false" path. The top ("true") path continues with more tiles designed to nurture the lead further. Because the contact clicked the link, Dynamics 365 generated a lead for that contact, which represents their expression of interest in the product promoted in that white paper. 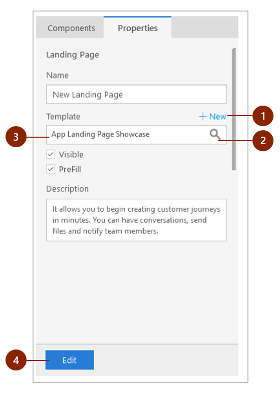 Some tiles along this path might initiate or evaluate lead interactions (such as surveys or event invitations), while others might generate internal events (like assigning a task or launching a workflow in the CRM system). As the contact interacts with your initiatives, the lead builds up its score until it's ready to forward to sales. The bottom ("false") path starts with another email tile, which sends a reminder with a second chance to get the download, after which the contact might continue down the same type of nurturing path if they respond, or get dropped for now if they don't. To view and create your customer journeys, go to Marketing > Marketing Execution > Customer Journeys. This brings you to a standard list view, where you can search, sort, and filter the list to find an existing journey—or create a new one by using the commands in the command bar. When you create a new customer journey, you'll first be presented with a list of customer-journey templates, which can help you get started quickly. The Select a Journey Template dialog box provides a categorized overview of templates and a search form to help you find the one you're looking for. Each template represents a particular type of campaign, and includes a preconfigured pipeline and a few related settings that will help you create a customer journey of the selected type. You can also choose to start from scratch instead of using a template. The pipelines provided by a template represent the form and logic of your campaign, but you'll still need to configure the various tiles by—for example—assigning the specific marketing email message that should be sent by each email tile. When creating or editing a customer journey, you'll be working on the customer-journey form page. At the top of this page, you'll see the canvas, where you'll build up your campaign pipeline by adding, arranging, and configuring the tiles that represent each step in the journey. General settings and fields for metadata are available further down on the page, below the canvas. Use the Design tab to design your campaign by arranging tiles into a logical flow, and then configure each tile. You can add tiles to the pipeline by dragging tiles from the Toolbox tab on the right side of the canvas to the appropriate position on the canvas. You can also add tiles by using the command bar and arrow keys, as described in the next section. The first tile in the pipeline establishes the target segment for the customer journey. This is what determines which contacts get sent down the pipeline. 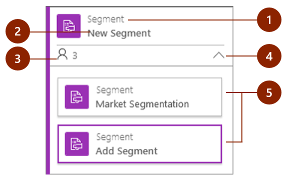 You'll typically start with a segment tile, which finds contacts based on a logical query (a dynamic segment) or on a static segment, where individual contacts are added and removed manually. After they are added, most tiles provide features such as those illustrated in the following figure. Tile type: Shows what type of tile it is (segment, email, trigger, and so on). The icon and color also indicate this. Tile name: Shows the name assigned to this particular tile. Tile status: Shows key statistics about the tile, such as how many contacts are waiting here or how many messages it has sent so far. The information shown varies by tile type. Expand button: Some types of tiles can contain nested tiles. Select the expand button to open or close the nested-tile display. Tiles that don't accept nested tiles don't show a button here. Nested tiles: You can view, select, configure, or remove existing nested tiles here when the container tile is expanded. You can add new nested tiles by dragging them here or to the container tile (this also works when the container is collapsed). To configure a tile or nested tile, select it in the pipeline and then go to the Properties tab to the right of the canvas, where you'll find all the settings that apply to the type of tile you've selected. For a complete list of all available tiles, and information about how to use them, see the Customer journey tiles reference. Though most people add and arrange tiles by dragging them to the canvas, you can also do it by using the toolbar above the canvas, and you can even build up a pipeline without using the mouse at all. This makes the solution more adaptable to your working preferences while also making it more accessible for people who have trouble working with a mouse. Select Add in the command bar to open the add-tile drop-down list. You can also select the Tab key until the Add button is highlighted or its name is read aloud by a screen reader. Choose the type of tile you want to add from the drop-down list by using your mouse, or by using the arrow keys and the Return key. The pipeline is now updated to show all the available insertion points where you can drop your new tile. Use your mouse, or arrow keys and Return key, to choose the location and drop the tile there. Each tile represents a step in the customer journey, and you'll make configuration settings to establish what happens at each of these steps. Most types of tiles interact with some other type of record in Dynamics 365, such as a target segment, marketing email message, landing page, event, or action. Other types of tiles—like schedulers, triggers, and splitters—react to things that happen during the journey itself and control the path that each contact takes when these things happen. To configure a tile, select it in the pipeline, and then go to the Properties tab to the right of the canvas, where you'll find all the settings that apply to the type of tile you've selected. When you add a new tile, its Properties tab is automatically activated so you can start configuring that tile right away. For tiles that must refer to some other record in Dynamics 365, like emails or events, you can choose to leave the record unspecified, choose an existing record, or create a new record to use with that tile. All tiles of this type include the Properties settings highlighted in the following figure. New: Creates a new record of the type required by the current tile. Select to open the quick-create flyout, which slides in at the top of the screen and requests values for all the required and most-import settings for your new record. When you complete the quick-create form, your new record will exist and be linked to your tile, but probably will require more work before you can use it. You might choose to finish it now by selecting Edit to open the full form for the record, or you could leave it for later and instead continue to concentrate on building the structure of your customer journey for now. Search button: Select to find an existing record of the type required by the current tile. To narrow the search, start by entering part of the record name you are looking for in the field next to the search button, and then select the button. Current record: If the tile is already configured, this shows the name of the record associated with the current tile. As mentioned, you can also use this as a search field, together with the search button, to look for other existing records. Edit: If the tile is already associated with a record, select to open the full form for that record. From there, you'll have full access to all that record's information and settings. One of the most important choices you'll make when setting up a customer journey is deciding which of your contacts to include on the journey. The most common way to target a customer journey is to start with a segment tile and then choose a segment for it. You can combine several segments and choose the relevant logic for combining them (such as union/intersection or include/exclude). All Dynamics 365 for Marketing instances must provide a subscription center, which enables contacts to sign up for various mailing lists. You'll probably want to set up customer journeys to send messages to each of these mailing lists from time to time. 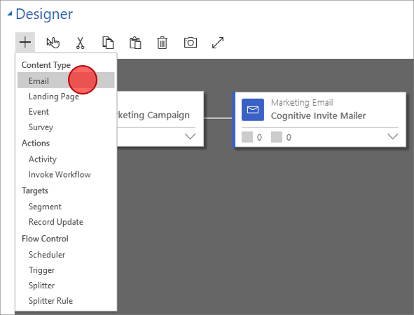 To target a mailing list with a customer journey, place a segment tile configured to load a subscription list as the first tile in the journey. For more information about subscription lists and the subscription center, see Set up subscription lists and subscription centers. Set up a customer journey that starts with a segment group tile, as usual. Select a child segment tile and open the Properties tab. Set the Segment source to Subscription Marketing List, which activates the Marketing List field. Then set the Marking List to the name of the subscription list you want to use for this journey. When a customer journey targets a subscription list, then any contact that unsubscribes from that list using a subscription center will automatically be removed from that journey within about 24 hours, even if they are already partway through it. However, if a Dynamics 365 users removes a contact from the list manually using the Dynamics 365 interface, that contact will continue to be processed by any journeys they already are on, and may continue to receive messages until all active journeys are complete. For this reason, it is usually best to request all contacts to manage their own subscriptions using the subscription center. Use the General tab to give your journey a name, assign ownership, set its execution schedule, choose content settings, view its timeline history, and more. You must set each customer journey to target either contacts or accounts. Use the Target setting on the General tab to configure this option for each journey. When you target contacts, the journey will treat each contact as an individual, without considering the company (account) that the contact works for. Trigger tiles can send all contacts from the same account down the same path. Activity tiles can generate just one activity (such as a task or phone call) for each account, even if several contacts from that account are included in the journey. Launch-workflow tiles can trigger their workflow just once for each account, even if several contacts from that account are included in the journey. Create-lead tiles can generate leads associated with accounts rather than contacts. Journey insights shown in the Data panel can be filtered by account. If data protection is enabled for your instance (for example, because you need to comply with the GDPR), then use the Minimum consent setting to control the minimum level of consent that each contact must have provided to be included on this journey. The level you choose should depend on the types of operations your journey will execute. It is your organization's responsibility to ensure that it is operating in full compliance with all relevant data-privacy regulations when you use customer journeys and all other features of Dynamics 365 for Marketing. All customer journeys are active for a limited time. During this time, the journey processes all contacts that are part of its target segments, stepping them through each tile according to its settings. The journey starts by processing all contacts that are already in its segments, and it will continue to process new contacts that are added to the segment during the time it is active. At the end of the schedule, it stops processing all contacts, regardless of where they are in the journey. Use the Start date and time and End date and time settings on the General tab to set up the start and end dates, and use the Time zone setting to establish the time zone to use when interpreting these values. Content settings are sets of standard and required values that are available for use in marketing email messages. Each includes a subscription-center link, a forward-to-a-friend link, social-media links, your postal address, and other information that can be placed into the message as dynamic values by using the assist-edit feature. You'll set up each customer journey to use a specific content-settings record, which means that all messages sent by that journey will use the same content settings. However, each journey can use a different content-settings record, which means that you can use an identical marketing-email design in two or more customer journeys, each specifying a different set of content settings. To choose the content settings used by a journey, go to its General tab and make a selection for the Content settings field. If you have more than one set of content settings, exactly one of them will be the default and will be applied automatically to each new customer journey that you create. For more information about how to establish the default content-settings record for new journeys, see Default marketing settings. Usually, a journey takes each contact through its pipeline exactly once. Even if you use several segments, and a given contact appears in more than one of them, each contact is processed at most once. However, you can also set up a recurring journey in which all contacts are reprocessed at regular intervals during the active period. All segment membership criteria are re-evaluated at the start of each recurrence, so contacts can be added or removed between cycles. Open your journey and go to the General tab. Set Is recurring to Yes. This opens two additional settings here. Set the Recurrence interval to the number of days each recurrence should last. Set the Recurrence count to the maximum number of recurrences each contact can experience. interval * count ≤ end date – start date. A journey's suppression segment contains a list of contacts that the journey won't send any messages to, even if those contacts are also included among the segments explicitly targeted by the journey, and even if those contacts are already partly through the journey. You can use any existing segment as a suppression segment. To choose a suppression segment for your journey, open its General tab and then choose a segment in the Suppression segment lookup field. When you first create a new customer journey, and while you're working on it, the journey stays in draft status. (The status is displayed above the journey canvas in the Status Reason field.) While it's still in draft status, the journey is inactive and it won't try to send any messages or do any other processing. When everything's in place and you're ready to start running the journey, you publish it. This updates the journey's Status Reason to Published, and as soon as the specified Start Date arrives, the journey will start processing all contacts in its target segment. Double-check the Start Date and End Date on the General tab. The customer journey won't do anything until the Start Date arrives and it will stop processing all contacts, no matter which tile they're on, as soon as the End Date arrives. Remember also that any contact who joins the target segment while a journey is running will also be processed by that journey, starting at the first tile. Select Check for Errors in the command bar to verify your campaign setup and check it for errors. This step makes sure that all required marketing emails and pages are assigned and published, and also checks for other prerequisites and common errors. If problems are found, you'll see an error message with advice for how to fix it. Continue to check, fix reported errors, and check again until your journey passes the test. Now you're ready to publish, so select Go Live in the command bar. Dynamics 365 runs the error check one last time. If your journey passes, it is published to the marketing services, which also host your published marketing email messages and marketing pages. <your_domain> is the root of your Dynamics 365 for Marketing instance (such as "contoso.crm.dynamics.com"). <email_id> is the ID for the message you want to check. To find this ID, open the message in Dynamics 365 for Marketing and find the value of the id= parameter shown in your browser's address bar. Search for the value of the field "msdyncrm_emailbody" in the returned JSON. Copy the value of that field into a text program that can tell you the exact size of the HTML content.